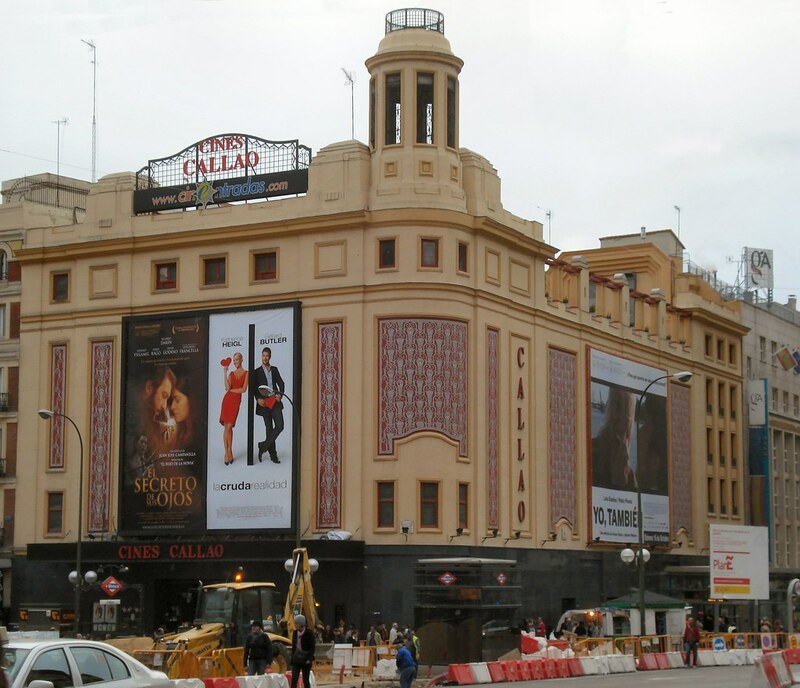 The Cine Callao, designed by architect Luis Gutierrez Soto in a ‘Classical’ style and constructed in 1925 to 1926, it opened 11th December 1926 with the film “Luis Candelas, el bandido de Madrid”. It is one of the famed movie palaces of the Gran Via, this is at the intersection of the Plaza del Callao. It has a prominent corner site and was originally built as a twin theatre, with a second 822-seat ‘open air’ auditorium on the roof, which has been closed for many years. The interior was re-modeled in the late-1950’s or early-1960’s in an Art Deco style which swept away the former Classical interior. In the 1990’s, when I visited, there were 1,147 seats including two balconies. On the main floor seating, I counted 30 rows of 24 seats, but I didn’t visit the closed balcony. I’m not sure if the balcony is where the second screen is. As of 2007, auditorium 1 has 1,101 seats and auditorium 2 has 429 seats. Here’s a postcard in my collection from 1954 with the Cine Callao on it, as well as another one, but which one is it?! A photo of Cine Callo from October 2009. Theatre opened 11 December 1926.